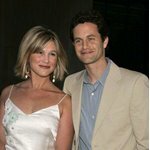 Hailing from Panorama City, California, Kirk Cameron kicked off his acting career at age 9 with work in TV commercials. He went on to make guest appearances in such TV series as “Bret Maverick” (1981), “Disney's Wonderful World” and “Herbie, the Love Bug” (both 1982), as well as acted in TV movies like “Beyond Witch Mountain” (1982) and “Starflight: The Plane That Couldn't Land” (1983) before landing his first regular gig on the short-lived ABC drama series “Two Marriages” (1983), playing Eric Armstrong. Next, Cameron was cast alongside Stacy Keach in the made-for-TV film “Mickey Spillane's Mike Hammer: More Than Murder” (1984), directed by Gary Nelson, and appeared with Julia Duffy, Charles Haid and David Huffman on an Emmy-nominated TV film called “Children of the Crossfire” (also 1984). His bit breakthrough, however, did not come until the following year when he won the starring role of Mike Seaver on the popular ABC family sitcom “Growing Pains,” which ran for seven seasons from 1985 to 1992. The actor nabbed three consecutive Young Artists awards for Best Young Male Superstar in Television in 1986 to 1988, two People's Choice awards for Favorite Young TV Performer (1988-1989) and a Blimp award for Favorite TV Actor at the 1990 Kids' Choice annual ceremony. He also was nominated for two Golden Globe awards. Subsequently, Cameron emerged as a heartthrob in the late 1980s. His face graced the covers of numerous teen magazines, including “Teen Beat,” “Tiger Beat,” “16” and others. This put Cameron on the radar of producers who soon cast him in a string of starring roles. He portrayed Dudley Moore's son in the 1987 hit comedy “Like Father Like Son,” from which he took home a 1988 Saturn for Best Performance by a Younger Actor, teamed up with Jami Gertz and Roy Scheider for the drama “Listen to Me” (1989), a box office disappointment directed and written by Douglas Day Stewart, and played the brother of Jenny Robertson on the made-for-TV film “Little Piece of Heaven” (1991). After the demise of “Growing Pains,” Cameron could be seen starring with wife Chelsea Noble in the TV film “Star Struck” (1994), portrayed Dexter Riley on the Disney television film “The Computer Wore Tennis Shoes” (1995) and returned to series TV with his own sitcom, “Kirk,” which was broadcasted on The WB from 1995 to 1997. 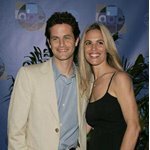 He once again acted with his wife in the 1998 Disney TV film “You Lucky Dog,” by director Paul Schneider. Cameron departed mainstream movies after the cancellation of “Kirk,” although twenty years after “Growing Pains” ended, he reprised his coveted role in a 2002 “Growing Pains” television film and later for another TV film called “Growing Pains: Return of the Seavers” (2004). He also rejoined the cast of “Growing Pains” for a CNN’s “Larry King Live” (2006). Apart from this, Cameron, who is an avid Christian evangelist, has focused his work almost solely on Christian-themed productions and joined Cloud Ten Pictures, a company that produces Christian themed films. He starred as TV journalist Buck Williams in “Left Behind: The Movie” (2000, released theatrically in 2001), which was adapted from the New York Times bestselling book of the same name. He also recreated the role in the direct-to-video “Left Behind II: Tribulation Force” (2002) and the movie “Left Behind: World at War” (2005), and had a supporting role as Josh in another Cloud Ten Pictures called “Miracle of Cards” (2001), opposite Catherine Oxenberg, Thomas Sangster and Richard Thomas. Cameron will star opposite Erin Bethea in the drama film “Fireproof,” scheduled for an August 2008 release. This project is directed by Alex Kendrick and co-penned by Alex and Stephen Kendrick.